Can the sequel live up to expectations stretched to Elasticgirl-like limits over the last 14 years? The answer may rest in Pixar’s history. Even as it first lit up screens in 2004, the family friendly animated gem "The Incredibles" drew comparisons to the dark 1980s "Watchmen" comic book series. Both featured a similar jumping off point: a world where superheroes are banned as more-trouble-than-they're-worth menaces. That's in stark contrast to Hollywood, where superhero and fantasy franchise sequels seemingly fly into production before the final credits roll on the original. The approach has been elevated, with occasional turbulence, to an art by Disney, the home of Pixar, which launched "The Incredibles." So far, the most amazing thing about “Incredibles 2," which opens Friday, is it that took 14 years for the crime-fighting Parr family to return. But can writer-director Brad Bird’s sequel live up to expectations stretched to Elasticgirl-like limits over time? The answer may rest in Pixar’s history. Nostalgia, as Pixar proved with its “Toy Story” series, can be powerful, if employed well and sparingly. Eleven years spanned “Toy Story 2” and the brilliant “Toy Story 3.” By the time the next next installment arrives in 2019, it will have been a decade since “TS3” and nearly a quarter century after the original opened. The same could be asked of “The Incredibles,” a rollicking, family fueled adventure that packed laughs, thrills and heart, melding comic book superhero tropes into an all-ages epic. The youngest first fans of “The Incredibles” are now college age, though repeated home viewings likely fostered new aficionados and maintained the flick’s following among those of us who took kids the first time around. Disney executives know that popular movie series, for better and worse, generate feelings of ownership among the most ardent fans. That’s true for the studio’s Marvel Comics Universe films. It’s even more so for “Star Wars,” which Disney revived with three huge hits – two sequels and a one-off semi-prequel – before “Solo: A Star Wars Story,” which has underperformed at the box office. Perhaps that’s due, in part, to seeing other actors play young versions of icons like Han Solo and Lando Calrissian (though Chewbacca looks pretty much the same). In animation, no one has to age, even if the voices sometimes change (Spencer Fox, now 25, no longer speaks for Dash). The rest of the primary cast is back, with baby Jack-Jack primed to take on a bigger role, as teased at the end of the original. 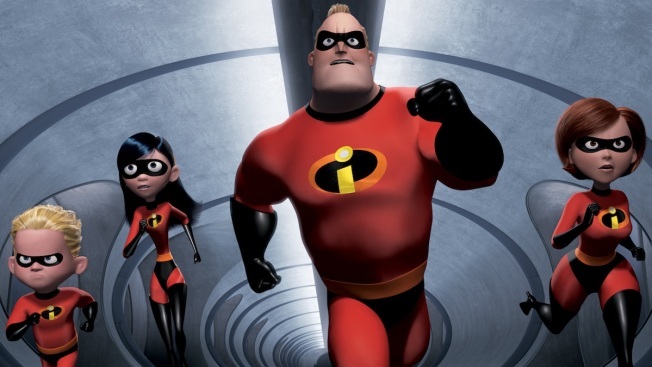 “Incredibles 2” might be stuck in time. But it’s finally moving ahead in an age when, at least in the movies, we can’t seem to get enough of our old heroes.